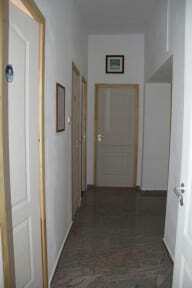 Hostel Timun is situated in the heart of Novalja. The building has a history over a century long – First it was a hospital for sailors, during Second World War it was converted into a prison, then it served as a Town Hall and after that it housed the first restaurant in Novalja. The building was remodeled in 2013 and now serves as a hostel and restaurant Timun. In the mornings Timun restaurant has breakfast menu with a selection of fresh natural juices, coffee or tea. For the rest of the day we offer foreign and domestic dishes and our bar has various cocktails as well as domestic wines and schnapps. Additionally, Timun has free Wi-Fi as well as two television sets for sport enthusiasts. 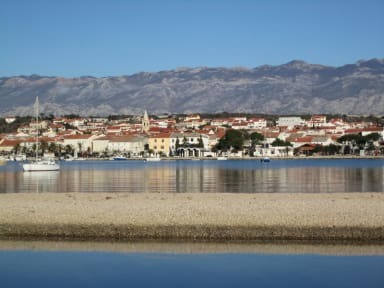 We also offer transportation from airports and some of the larger Croatian cities and we organise expeditions to several national parks where you can discover the unique beauty of nature in Croatia. Our location in pedestrian zone of the town center presents a convenience to our guests. Sea is mere 15 m away, the best night club in town – Cocomo – is situated only 25 m away, various bars and convenience stores are located in the same street as Timun, as well as newsagent's stand (tobaco) and souvenir shops, an ATM machine, a casino, a pharmacy, and money exchange office. Taxicab stand and a bus – bound for Zrće Beach where party never stops – are only 50 m away form Timun, and catamaran bound for port-city of Rijeka is less than a minute away. Hostel Timun has both private and shared rooms. Private rooms have balconies with seaside views. Two shared rooms also have seaside views and all of our rooms are equipped with an air conditioning unit. Communal terrace is a great place for socialising and meeting new people and in the evening it can serve as a place for pre-party before going out to many of Novalja's night time destinations. Check in from 13:00 to 17:00.